We’ve got wine blending, spring concerts, and brewery parties! Check out everything going on this weekend. 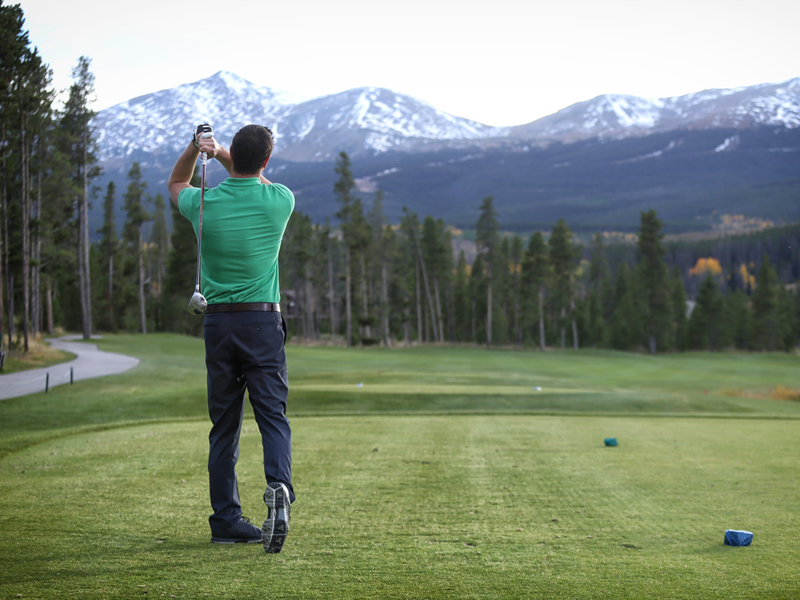 Golf in Breckenridge – Get back in the swing of spring! There are many reasons why we play the beautiful game of golf; stress relief, character building, exercise, social aspects, or maybe it is the connection between the game and everyday life that golf legend Bobby Jones highlighted so long ago. Whatever keeps you coming back, you are sure to find it on the golf courses of Breckenridge and the surrounding Summit County. As the snow melts and overcast days give way to spring sunshine, golf season in Breckenridge ramps up in a big way. The golf courses in and around Breckenridge offer unparalleled natural beauty and a challenge for golfers of all skill levels. You can read more about the area courses below, however, the best way to discover golf in the high country is to book a tee-time and experience it for yourself. Located just a few miles north of Main Street Breckenridge, this is the only golf course located within the town of Breckenridge. Often included in the annual top 20 courses in Colorado and built on an old mining encampment, the Breckenridge Golf Club offers a truly unique golf experience. The course consists of three unique 9 hole courses all designed by the Jack Nicklaus Signature team. Playing at over 9,000 feet in elevation, incredible panoramic views of the Rockies, playing a round of golf here is a must for even casual fans of the game. Book a tee time or learn more here. The Ranch course is a Robert Trent Jones, Jr. designed course. This course is often viewed by locals and golf fanatics as the crown jewel of Summit County golf. The challenge of the links style course design on the front nine, the unique setting of a mountain valley for the back nine all make for a golf outing you will not soon forget. To learn more about both courses and to book a tee time please click here. Arguably the most affordable golf outing in Summit County, Copper Creek is a mountain golf experience you must enjoy for yourself. Located at the base of Copper Mountain with spectacular views of the 10-mile Mountain range, Copper Creek is an 18-hole course designed by Pete Dye. As a Pete Dye course, you bet you can expect copious amounts bunkers and it also boasts the highest tee box in America at just over 9,800 feet. To book this unique golf outing, click here. Breckenridge and surrounding Summit County are home to world class golf courses. With course designs from legends like Jack Nicklaus to Pete Dye, Breckenridge and Summit County have a golf outing to suit your golf style and most importantly your golf budget. To book your golf getaway in Breckenridge visit breckenridgediscountlodging.com today! https://www.bestofbreck.com/wp-content/uploads/2017/05/Friday-April-5-17.jpg 1500 1500 Tor Linzee https://www.bestofbreck.com/wp-content/uploads/2015/08/logo-332x156.png Tor Linzee2017-05-05 09:37:422018-04-13 09:11:44Golf in Breckenridge - Get back in the swing of spring! 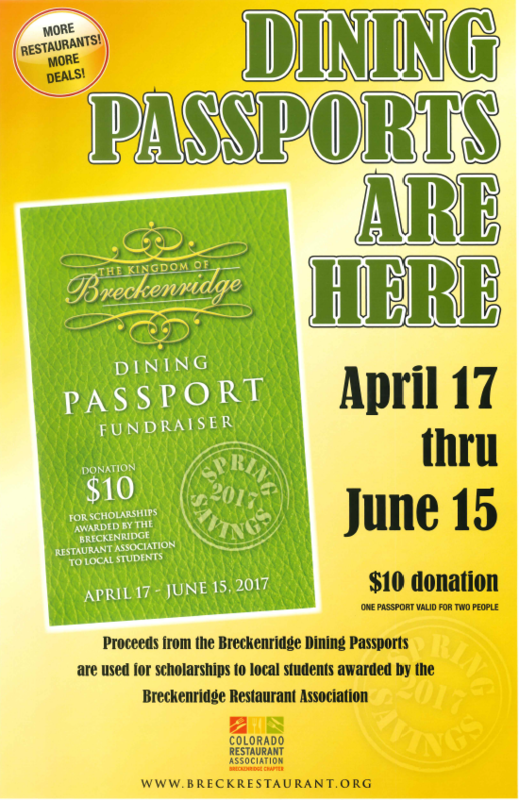 FILL UP ON SAVINGS: DINING PASSPORTS RETURN TO BRECK! Mud season is upon us in Breckenridge! The slopes are taking a rest from skiers and riders until the fall, but the fun in town is far from over. This slower season in Breck brings some great deals along with less crowds and unbelievable sales. End of season deals span everything from gear to lodging and shopping to dining. What else is going on in Breck that makes visiting this spring so special? In this mountain town, there are activities and events to partake in every day. Check out what’s happening in town and start planning your stay with great lodging deals found here. What’s so great about the Dining Passport? The Breckenridge Restaurant Association’s Dining Passport enables you to take advantage of extremely discounted and half priced fine dining experiences throughout town until June 15th. 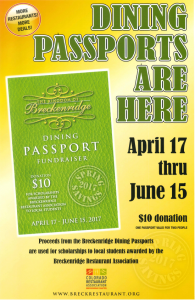 Each passport is good for up to two people and only costs $10, which benefits the Breckenridge Restaurant Association scholarship fund for local students who are employed by or interested in career opportunities in the restaurant and hospitality industries. Passports can be purchased at participating restaurants as well as the Breck Welcome Center on Main Street. Après Handcrafted Libations: April 17 – June 15- $10 Passport Beer Flight or $10 Passport Whiskey Flight Flights are pre-chosen. Some restrictions may apply. Not valid with any other offer. Happy hour- 4-6pm and 9-Close Closed April 24-27. Bangkok Happy Bowl (new! ): Located at 103.5 N. Main Street and featuring $8 classic sushi rolls. Free Appetizer with purchase of 2 Thai Dinners Sunday through Thursday 5 – close Not valid with any other offers. Happy hour daily 4-6 pm, two for one on select Thai apps, $8 classic sushi rolls, $1 off drafts, wines and wells. Daily cocktail and beer specials. Breckenridge Tap House (new! ): Located at 105 N. Main Street and open from April 17-23 and May 22-June 15, featuring 50% off your check. Not valid during Happy Hours. Closed April 24- May 21. Briar Rose Chophouse: Deals are valid from April 17- May 20 for a two-course seasonal prix fixe meal for $38. Wine or cocktail pairing available. Also, from May 21- June 15, Briar is offering passport holders 2-for-1 entrées with the purchase of a bottle of wine or an appetizer or a dessert. The promotions will be available in the saloon or dining room. Reservations for the dining room highly recommended. Burke & Riley’s Irish Pub: From April 17- June 15, passport holders receive 10% off their entire bill. From May 1- 31, locals will receive 50% off alcohol/drinks and 30% off food menu items (be prepared to show local ID). The Canteen: From April 17- June 15 passport holders will receive a free Queso Fundido with the purchase of two meals. C.B. & Potts Restaurant and Taproom: From April 17- June 15, passport holders who buy one entrée, will receive $10 off the second entrée. Crêpes a la Cart: From April 17- May 25, passport holders who buy one crêpe, will get the second one 50% off. From May 26- June 15, the Dining Passport gets you 20% off a crêpe with the purchase of a beverage. Crêpe Kitchen (new! ): Located under the post office at 309 B South Ridge Street, passport holders who buy one crepe will get the second crepe at 50% off from April 17- May 25 and from May 26- June 15, passport holders receive 20% off a crêpe with purchase of a beverage. Call in your order for pick-up. Downstairs at Eric’s: From April 17- June 15, passport holders can take advantage of “Kids Eat Free” …. with the purchase of one adult entrée per kid’s entrée. Some restrictions apply. Fatty’s Pizzeria: From May 10- June 15-Sunday- Thursday, 4-10 pm only, two for one entrées. Dine- in only. Pizza, Sandwiches and Clam Bakes excluded. Closed April 24- May 9. Giampietro: From April 17- June 15, passport holders receive the three-course menu for $27. Specially selected wine-pairing list also available. Peroni & Negroni Happy Hour 9 – 11 pm, also offering Late Night Food. Hearthstone: From May 12- June 15, Thursday- Sunday, Dining Passports get you three-course dinners for $35 and two for one entrées Monday- Wednesday. Closed April 17 – May 11. La Francaise Bakery: From April 17- June 15, the Dining Passport gets you two for one sandwiches, omelets and crêpes with purchase of drink or pastry with each sandwich, omelet or crêpe. LoLo Juice: From April 17- June 15, passport holders receive $1 off any large smoothie; $3 off any 2 large smoothies! Open 8 am- 4 pm daily. Mi Casa: From April 17 – May 4 and May 25 – June 15, Sunday- Wednesday, passport holders receive two for one entrées. Thursday – Saturday: Date Night Menu- 3-course dinner for $30 per couple. Both promotions available after 3:30. Closed May 6 – May 24. Michael’s Italian Restaurant: From May 19- June 15, passport holders can get two for one dinner entrées. Closed April 23- May 18. Modis: From April 17- June 15, passport holders receive 3 Courses for $33. ½ Priced Select Bottles of Wine. Some restrictions apply, please ask server for details. Happy Hour starts at 3pm. Dinner Service starts at 5 pm Wednesday – Sunday. Closed Mondays and Tuesdays from April 24-June 13. Motherloaded Tavern: From April 17- June 15, passport holders receive 2 for 1 Entrées from 11:30 am- 1:30 pm and 5-7 pm every day. Gratuity may be included on total before discount. DINE- IN ONLY. Ollie’s Pub and Grub: From April 17- June 15, Monday – Thursday, open – close, the Dining Passport gets you the following: Choose any two food items for $15. Excludes large wing order and certain other items. Does not include sales tax. Not valid with other discounts or promotions. Any substitutions/ modifications will be charged accordingly. DINE- IN ONLY. Late Night Happy Hour runs Sunday-Thursday from 10pm- Midnight. Closed May 7-9. Park & Main: From April 17- June 15 after 5pm only, passport holders who buy one entrée will receive a second entrée or sandwich of equal or lesser value for free (with the purchase of a bottle of wine or an appetizer or a dessert). Happy Hour is from 3-6pm daily with 50% off bottles of wine and infusions. Pho Real (new! ): Located at 301 N. Main St., passport holders can take advantage of the following deals from April 17- June 15: Combo Special: (1) Banh Mi, Vermicelli Bowl or Small Pho and side Spring Roll + a Drink (excludes Beer/Wine) for $10. Closed May 1-May 15. Relish: From April 17- June 15, passport holders can get two courses for $30 per person. Choose an entrée paired with a selected item for $30 per person. Closed April 30- May 25. Robbie’s Tavern (new! ): Located in the Grand Colorado Resort on Peak 8 at 1627 Ski Hill Road, passport holders can enjoy a free order of pretzel knots with the purchase of two alcoholic beverages from April 17- June 15. Closed Monday- Wednesday during May. Subway (Breckenridge location only): From April 17- June 15, passport holders can enjoy a free 6-inch sub when they buy any 6” sub and any drink to get a regular 6” sub of equal or lesser price Free! Traverse Restaurant & Bar (in The Lodge at Breckenridge): April 17- June 15- 2 for 1 Entrées with purchase of an Appetizer or Bottle of Wine. Certain exclusions may apply, may not be combined with any other offers. 20% gratuity added to all discounted checks. Happy Hour every day from 4-6pm. $3 off appetizers, $4 house wines, $5 well drinks, $2 select drafts. Twist: From April 17- June 15, passport holders will receive two courses for $25 per person. You can also choose an entrée paired with a selected item for $25 per person. Closed April 30- May 25. It’s time to start packing up the car and your loved ones! The staff at BOB can’t wait to see you in Breck this spring for some fun in the High Country with the entire family. Don’t forget to use #bestofbreck when you are in town to be showcased on our Instagram! https://www.bestofbreck.com/wp-content/uploads/2017/05/Wednesday-May-3-2017-2.jpg 1500 1500 Karah Helena Kidger https://www.bestofbreck.com/wp-content/uploads/2015/08/logo-332x156.png Karah Helena Kidger2017-05-03 11:15:222017-05-03 12:10:57FILL UP ON SAVINGS: DINING PASSPORTS RETURN TO BRECK!